How long is the trek? How is the trekking route like? Do I need a guide? Deoria Tal is a small lake, perched at an elevation of 2438 metres, situated near Sari Village in the Rudraprayag district of Uttarakhand. 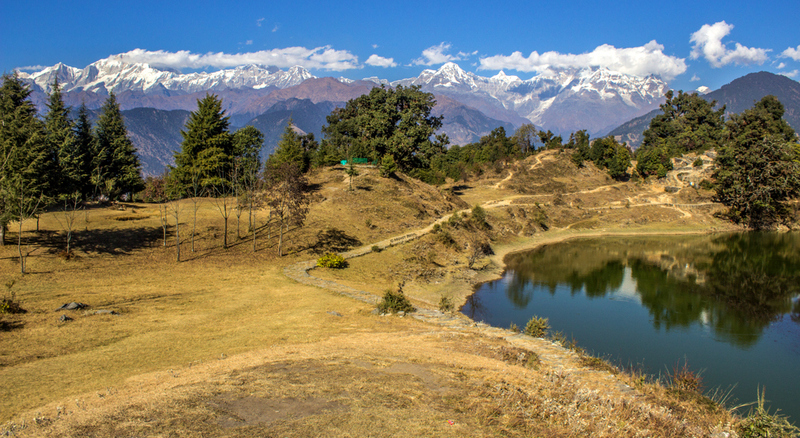 With a thick forest (the area lies under Kedarnath Musk Deer Sanctuary) on both sides and wide open meadows right in the centre, it is a perfect spot to spend the night in a camp and wait for Chaukhamba’s massif to reflect on the lake in the early hours of the morning. If weather permits, Deoria Tal is a solid vantage point to see and photograph The Greater Himalaya’s Gangotri Group of Peaks. Well, some of them; to name a few Jaonli, Thalaysagar, Bhartekunte, Rock Tower, Kedarnath, Kedar Dome, Kharchkund, Mandani, Janhukut and Chaukhamba. That and numerous bird species that inhabit the region. From stunning scenery to gorgeous frames in a matter of seconds. Deoria Tal will give you plenty to look forward to. The trek to Deoria Tal starts from Sari. That being said, you should know that all the local buses take their own sweet time and take multiple halts to fill in as many passengers as they can. If you opt for the Uttarakhand State Transport bus it will drop you at Rudraprayag. After this, there is no other choice but to board a local bus or a shared taxi. It should cost one person 700-800 bucks, Haridwar to Haridwar. Lie down, walk around, sleep, click, eat, camp, chase birds, run away from foxes chasing you (at night), Deoria Tal will give you plenty to look forward to. It’s a 2 kilometre of gradual yet easy ascent. The trail is rocky, well laid out and hard to miss; you cannot divert from it. And you don’t need a guide. However, if you’re trekking solo, you might as well take one. It’s your safety, it’s your call. Kedar Peak and Kedar Dome (left) and Mandani (right), engulfed in clouds, of course. Still magical! There are several budget accommodation options at Sari. You can either opt for a room in a lodge or a village home down in the village or camp around the lake. If you prefer cosy interiors then former is your obvious choice. Rates maybe higher in the peak season. This is the gist of it. If you have any further queries, feel free to leave a comment below or contact me through Facebook, Instagram or Twitter. I’ll get back to you as soon as I can. Stay safe, travel responsibly!